If Iceland’s capital isn’t on your list of places to ring in the New Year, it should be. We had the idea to celebrate New Year’s Eve in Reykjavik when Tim spent two months living and working in Iceland. In talking with the locals, he learned that Iceland’s fireworks laws are relaxed for New Year’s and a massive fireworks display is put on for the people, by the people. We watched the live feed from Reykjavik just after ringing in 2012 in Italy and made a resolution that we would be in Reykjavik to welcome in 2013. Now that we’ve spent New Year’s Eve in Reykjavik, we can tell you it’s a celebration with a lot more to it than just an incredible fireworks display. Fireworks are sold by ICE-SAR (the Icelandic Association for Search and Rescue), a self funded volunteer group with about 3000 individuals making up 100 search and rescue teams. All the proceeds from the fireworks sales go to ensuring ICE-SAR has the best equipment. It’s definitely a great cause since more than 1200 rescues (approximately four on any given day) happen in Iceland each year. Fireworks were already being lit off from the time we arrived in Reykjavik on December 29. 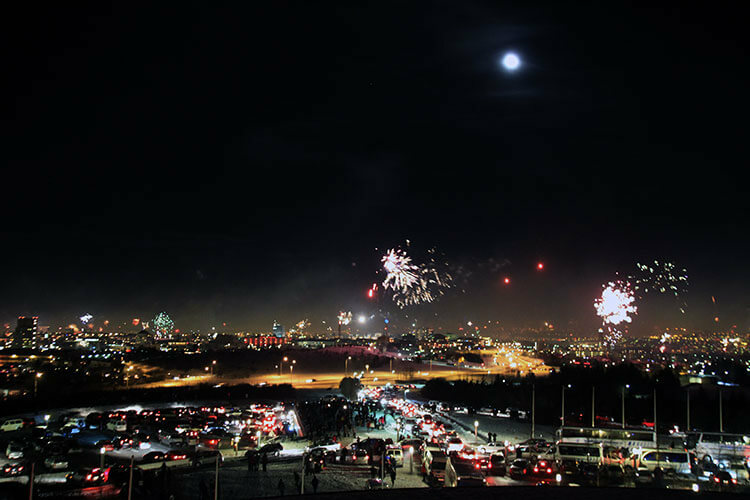 By 8:30pm on New Year’s Eve, fireworks lit up the sky almost constantly. From 11:30pm on, the fireworks just gained intensity until a massive barrage erupted at midnight. We’ve literally never seen anything like it. From our vantage point on top of the Perlan, we had fireworks rocketing into the sky literally from 360° around us. Icelanders ceremoniously start off their New Year’s Eve with a grand family meal. Tim and I decided to splurge and attend the grand gala dinner hosted by GJ Travel at Reykjavik’s famous landmark and water tower, the Perlan. We put on our finest, Tim in a suit and tie and me in a cocktail dress, and were welcomed to the party with champagne. We clinked our glasses together toasting to our good fortune to be celebrating New Year’s Eve in Reykjavik. We were seated with a lovely family of four from Paris, France who had also decided Iceland sounded like a great place to spend New Year’s. We shared wine and chatted about fabulous travels around the world with our new friends Ciaran and Naïr and their two very lucky boys Thomas and Marcus. We traded stories and tips over a delicious meal of smoked salmon and caviar, wild goose soup, and lamb. 10 bonfires (4 big and 6 smaller ones) are lit around Reykjavik at 8:30pm. The tradition of the bonfires dates back to the Middle Ages when fisherman would clean the house to ready it for the new year. They would burn all the old things in a massive bonfire. The tradition has carried on, but now-a-days Icelanders just gather around the bonfires to sing and symbolically burn the old. At 8:15 I swapped my heels for my moon boots and bundled up. It was quite the sight to see all of us ladies pulling on thermal leggings under our cocktail dresses and traipsing out to a fire burning in a field. We joined right in with the massive crowd, lighting sparklers and dancing around the fire as fireworks exploded around us. By 10pm Icelanders are heading home (though they definitely won’t stay in for the night!) to watch Áramótaskaupið, the New Year’s Comedy. It’s a special show that has been broadcast annually since 1966; it focuses on the past year from a satirical standpoint. 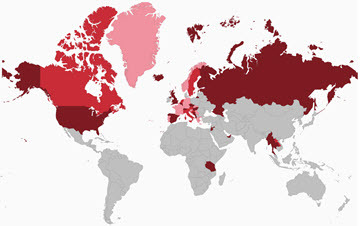 Over 90% of the population tunes in and it is the talk of Iceland the next day. After the bonfires, we returned to The Pearl while Icelanders went home to watch Áramótaskaupið and started our countdown to midnight. 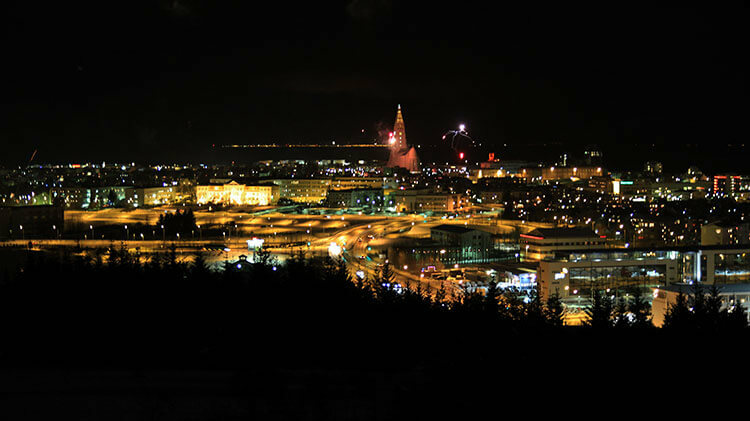 At 11:30pm as the explosions of fireworks became more and more frequent, we once again bundled up and headed outside to the Perlan’s 360° observation deck. Icelanders began to arrive in the parking lot below; some just to watch from the vantage point atop the hill, many to light off fireworks. Bars and pubs stay open until 5am and Icelanders definitely like to dance the night away! We headed home for the night around 1am since we had to be up at 6am again to begin our road trip around Iceland’s Ring Road, but the party was still going and the occasional bang of fireworks punctuated the morning. Reykjavik was seriously the best place we’ve ever spent New Year’s Eve. The fireworks display is unrivaled from anything else we’ve seen and we’d do it all again in a heartbeat. 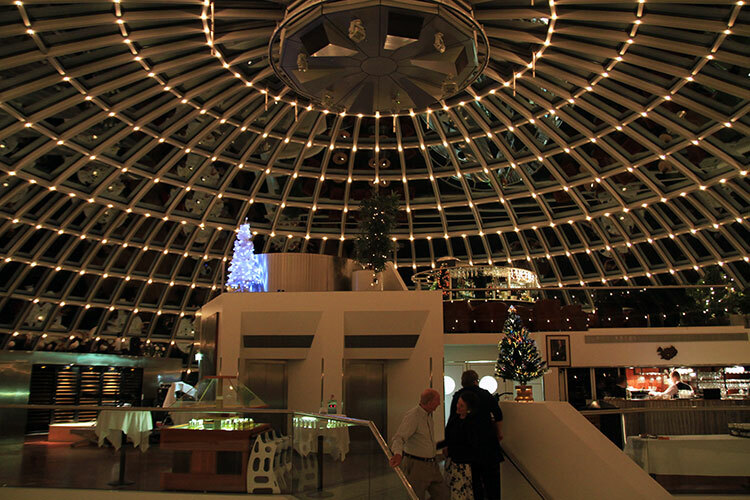 GJ Travel hosts the New Year’s Eve party at the Perlan. Hotel pick-up/drop-off, four-course dinner, and bonfire tour are included. €475 per person. Jacket and tie are required for men, dress (short or long) are required for ladies. Bring warm clothes such as leggings, hat, scarf, and gloves for the bonfire tour and watching the fireworks from the observation deck. Transfers back to hotels are at 12:30, 1:00, 1:30, and 2:00. We recommend the holiday apartment Túngata 32 or Hilton Reykjavik Nordica in Reykjavik. That is too cool, love the description and photos as well! Iceland’s gonna have to be a return trip for me and until then I can live vicariously through you!! 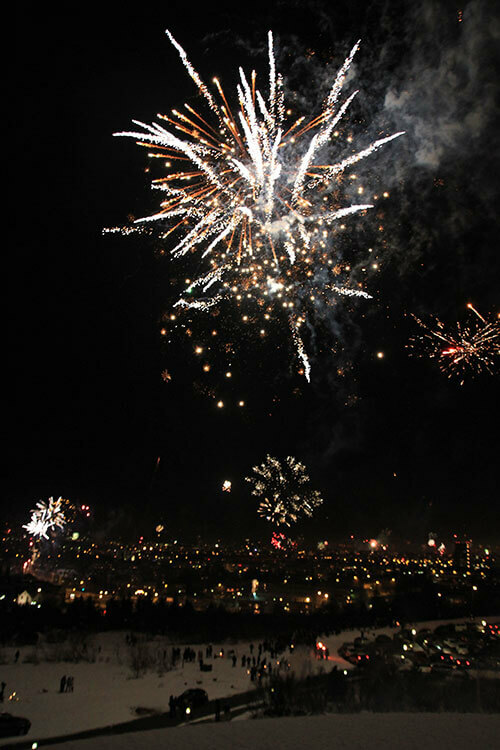 New Year’s Eve in Reykjavik was even more amazing that we imagined it would be. Definitely recommend it as must see place to ring in the New Year. Looks like a great night! I’d love to go to Iceland, and it sounds like being there at New Years was a really great experience. We did enjoy all the fireworks here in Freiburg, but being somewhere else sounds good too! It was our first time ever going somewhere specifically for New Year’s and we definitely weren’t disappointed. This is AWESOME – especially that bonfire! The bonfires were really fun to attend, Andrea. If we were to spend New Year’s Eve in Iceland again, we’d try to visit a few more around the city to see each of the different ones. What an awesome place to be for New Years! 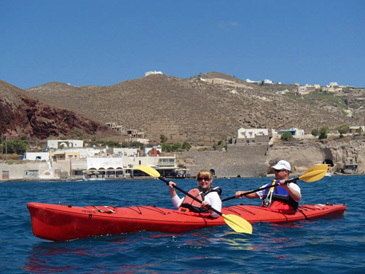 Looks like so much fun…..ahhh, I must be somewhere epic like that for New Years next year…. It was totally awesome! Way better than we even expected. Tim says we should spend every New Year’s Eve there. I wouldn’t be opposed to it! Such an amazing New Years story. We're going to Iceland this coming New Years and would love to have a similar experience! If the dinner price is too steep for us, do you know if it's possible to still go up to the Pearl and view the fireworks? Want to make sure we're not intruding! Thanks and great job as always. Loved reading your New Years Story. Me an my boyfriend are planning on spending 4 nights in Iceland this coming new year. We’ve always spent new year at home with family and friends but love the idea of doing something really different (It is also my boyfriends birthday on New years day so it would be a nice way to celebrate). I have struggled to find information about the best way to enjoy new year in Reykjavik and this sounds incredible. Was the Gala attended by people of all ages? We are 28. Although I love the sound of the gala the only trouble is the cost. It really is expensive so if we can’t afford to opt for the gala dinner do you have any suggestions of places we can view fireworks/join in with bonfires, enjoy food and drink etc at a lower cost? Hi Michelle! We’re 32 and had a great time at the gala! The bonfires are free and open to anyone to attend. You could definitely just go out to a bonfire and then watch the fireworks from the city completely for free. The gala was expensive but we figured it was a special occasion and decided to splurge. We definitely thought it was worth it and the view was absolutely amazing. Hi Michelle – How was your New Year’s in Iceland? We are planning on going to Iceland this year for New Years. Anything you would add to Jennifer’s comments? We are taking my two nieces (21 & 23) – we are in our 50s. Thank you. So you think we can just play it by ear and track down the bonfires on the night. Would we need to get transport or are the bonfires within walking distance? Having never been to Rekyjavik I have no idea of the scale. I guess transport on new years eve would be tricky but I didn’t want to just pay out to do an organised trip for convenience when we might get a much better experience just mingling with the locals. I hear the Hallgrimskirkja Church is a good spot for viewing the fireworks. I bet it was fab to view the skyline from the Pearl 🙂 Your photo’s are amazing. Will you be back this new year or have you got somewhere else in mind? Thanks again for your advice I appreciate it. 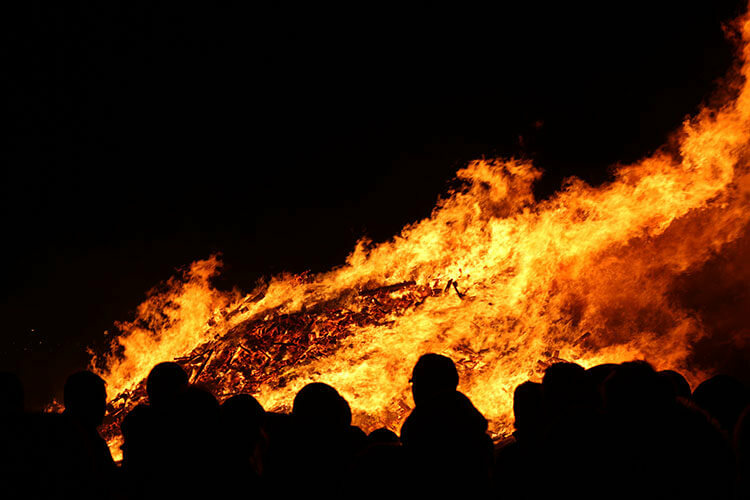 There are 12-13 bonfires for each of the neighborhoods of Reykjavik. There will be some within walking distance. A lot of locals gather at the pond to set off fireworks, but they are pretty much everyone And start as early as 7-8pm. Fireworks were still going off when we got up at 6am the next morning. You’ll have a great time! We wish we were going to be back in Iceland for New Year’s again. We’ll be at home in Italy this year. That sounds like a fabulous evening, Jennifer. I might have to move my trip a little further back so I can experience new year there. How did you go with driving around the ring road at that time of year? How fare in advance did you buy tickets? This is something that is definitely on my bucket list and would love to go this year, but i’m worried time is short and it’ll be booked up. Hi Avi! I would just reach out to GJ Travel to ask if they still have tickets if the gala dinner is what you want to go to. Enjoy Iceland! Hi! We are celebrating New Years Eve (and our wedding anniversary) in Iceland this year. I am so happy I came across this article. Since it is so close to the holiday and we dont have plans, do you think we will be able to find a bonfire and somewhere to see the fireworks? How much pre-planning do you recommend? Also, we rented a Jeep to drive the Golden Circle. Do you have any tips on the road conditions were? We live pretty far north in the US and are accostomed to snow/cold. But, we didnt know what to expect . . . any suggestions? First, happy anniversary! Iceland can be really romantic and is a wonderful place to celebrate. The bonfires themselves are free to attend and happen all around the city, so you’ll easily be able to attend one. The fireworks also happen all around the city in a steady stream for at least 12 hours, so even just out in the street you’ll be able to enjoy the show. There are quite a few budget airlines that fly to Iceland, including EasyJet and Wow from various cities in mainland Europe. Icelandair also regularly flies from London to Reykjavik for $199 round trip. So it’s definitely possible to get there inexpensively! Hey guys, I found your post a few months ago while casually searching for the best places to spend NYE, and now my husband and I are headed to Iceland for NYE 2017! Thanks for the inspiration! If you have any specific tips or recommendations about how to spend our 5 nights, I’d love to hear them. We are staying in downtown Reykjavik and definitely plan on the Blue Lagoon, Northern Lights excursion and probably a glacier trip. Thanks! There will be a lot to see an do and you’ll have no problem filling up your five nights in Iceland. Have you checked out our Iceland itinerary? It has all of our recommendations. Though you won’t be driving the entire Ring Road, days 1-4 and day 9 will give you plenty of suggestions for your trip. Enjoy! 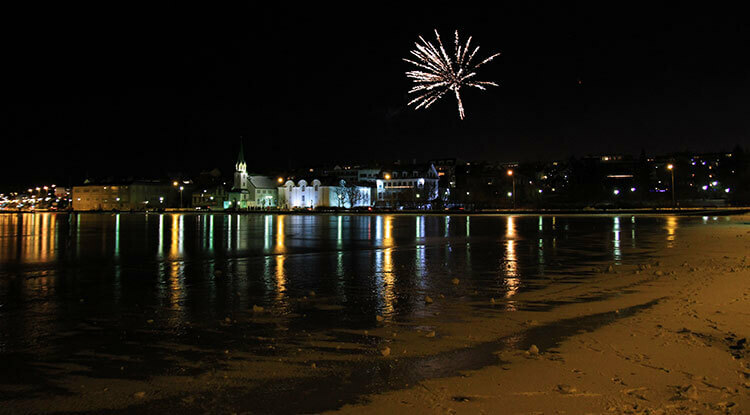 Spending NYE in Reykjavik is truly one of the best places in the world to ring in the New Year! I will definitely check out your recommended itinerary. We rang in 2016 atop the Perian’s hilltop. Most amazing firework display I have ever witnessed. Also attended a bonfire earlier that evening. Without a doubt, the best NYE of my life. A definite bucket list item for any travel bug. Glad to hear you also loved ringing in the New Year in Reykjavik, Jim! It’s truly the best place we’ve ever spent NYE. this is exactly what we are doing this year 🙂 – we visited Iceland in February and fell in love with it. BUT – I will just say – Hogmanay in Edinburgh will take a lot to beat ! Based on this write I have just booked the gala dinner and New Years Eve (and my birthday) in Reykjavik with the much better half. I´ve had some fantastic New Years, but am looking forward to this one very much indeed. Great write up and photos, mine will be on my blog in January once I sober up and warm up. By the way, did you do any open air swimming? Its definitely something that appeals to my warped sense of wellbeing. You’ll really enjoy New Year’s in Reykjavik! It’s a really fun party. As for the swimming, yes there are great thermal hot pools all over Iceland. The natural ones are the best experience, and every town and village has a swimming pool where the locals go. So it just depends on what you’re looking for – natural hot pot, local experience or touristic experience at the Blue Lagoon.